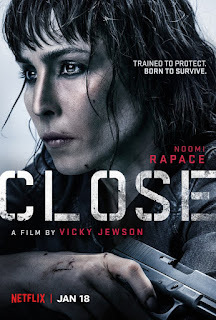 Written, directed and produced by Vicky Jewson, Close has just been released on Netflix. 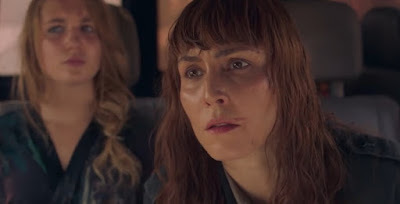 The movie stars Noomi Rapace, Indira Varma and Olivia Jewson - who also happens to be Vicky’s younger sister. Set in Morocco, Close follows Close Protection Officer Sam who has been hired to ensure that heiress, Zoe Tanner, arrives safely at the family home. Tanner has just inherited the controlling shares of Hassine Mining, a conglomerate that was founded by her stepmother's family. The stepmother in question is Rima Tanner (played by Varma) and clearly the two do not get on. Tired of her step daughter’s antics and lack of direction, Rima turns her attention to the signing of a massive contract. The company wants to control phosphate mining in North Africa, but has come up against rival business Sikong. On the eve of final negotiations, the family home suffers a security breach. The attempted kidnapping of Zoe Tanner has both her and Sam on the run. Finding few people that they can trust the duo must get out of Morocco or face certain death if the would-be kidnappers catch up with them. When a police officer is killed in the process, things become altogether more difficult both for Sam and for Hassine Mining. Rima, more concerned about the potential collapse of the deal than the attempted murder of her step daughter, does almost nothing to help the situation. What follows is a series of cat and mouse action scenes as Sam fights her way out of every tricky situation that arises. And there is a lot of action with Rapace flexing her muscles almost continually throughout. However, that’s about as substantial as it gets. While Close does provide answers to some of the film’s biggest questions, it all gets wrapped up very quickly with little real closure. As big original action movies go, Close never really offers anything more than well choreographed fight sequences. Characters lack any real depth and parts of the story are ultimately unresolved. It’s watchable if somewhat unmemorable. Review by Simone Eddison from NextFlicks - Check out their site using the link below.